Our dear Scholar and Ameer, As-Salaam Alaikum Wa Rahmatullah Wa Barakatuhu. In our country there is a practice of selling produces on the trees, before harvesting. For example produces such as clove, pepper, coconut, etc. are sold in such a manner. The land owner will plant, water and fertilize the plants to maximize the yield and when fruits are produced, those fruits are sold on an estimated price, so the buyer would have to harvest it and deal with it as appropriate. The buyer will pay the agreed price to the seller (the land owner) before harvesting. Once the sale is done (Price is agreed between buyer and seller), the Seller (i.e. the land owner) is no longer responsible for the produce, the buyer can harvest it immediately, or he can delay it until he sees fit, but it is his responsibility to protect the crops (from animals, robbers etc.) Is this practice allowed in Islam? May Allah bless you and give victory to this Ummah under your leadership. I understood from your question that you are asking regarding selling of fruits while on the trees (before being picked/harvested). For example a man would come to the owner of trees and offer to buy the fig fruits for the whole season, leaving the fruit (unpicked) on the trees, he eats from it and sells from it, unti the trees no longer have the fruits in that season and this is in return for a specific price. And you are asking if this is permissible. And in narration in Muslim it was in the following wording:«نهى عن بيع النخل حتى يزهو، وعن السنبل حتى يبيض ويأمن العاهة» “He forbade the sale of palm-trees (dates) unti they are nearly ripe and the ears of corn until they are white and were safe from blight”. All of the following Hadith are clear in showing the prohibition of selling fruits before they are ripe. The expression (Mantooq) of the Hadith is an evidence for the prohibition of selling fruits before they are ready for consumption, and the understanding of the meaning of the Hadith is an evidence for the permissibility of selling the fruits when they are suitable (ready for consumption). 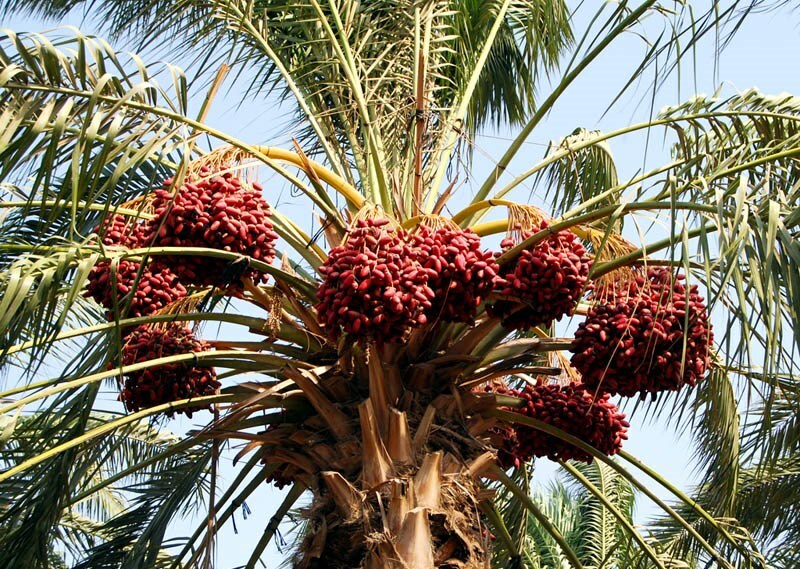 Therefore the guarantee of the tree that start producing fruits like olives, lemon, and palm trees and others is permissible if it is ready for consumption, and prohibited if it not ready for consumption. The evidence that the fruit is beneficial is that it is fit for consumption, this is what is understoof from the above mentioned Hadiths. Regarding the Hadiths that mention the prohibition of selling the fruit before being fit, there are many tafseer. In the Hadith of Jabir it mentions: «حتى يبدو صلاحه» “Until their benefit are evident” And it mentions: «حتى يطيب» “Until They are ripe”. And in the Hadith of Anas: «نهى عن بيع العنب حتى يسودّ، وعن بيع الحب حتى يشتد» “The Prophet ﷺ forbade the sale of grapes till they became black and the sale of grain till it had become hard.” (Narrated by Abu Daoud) And in another Hadith from Jabir: «حتى تشقح» “Until they (Tashqah) i.e become red and yellow” In the Hadith of Ibn Abbas: «حتى يطعم» “Until it can be fit for eating”. The Hadith which is agreed upon from the nattation of Jabir refers to: «حتى يطيب» “Until They are ripe” . From this it can can be seen that it is permissible to sell the fruits of the cucumber, Armeninan cucumbers and the like, it is allowed to conduct the guarantee transaction as soon as it gives fruits i.e. once the the flower begins to turn to a cucumber fruit, it can be sold, so the fruit is sold while still a flower and before it totally blooms, it can be sold in this state before it forms completely as long as the process of fruiting has started. This is not considered as selling an absent product, because its fruit comes out in stages and not in one go. Therefore all of the cucumber fruit is sold in its season, the ripe and non-ripe. There is no difference in fruits showing the readiness of the fruit, although they vary in manifestation, they can show redness when they are fit in the case of dates, or turning black in the case of grapes, or changing colour in pears, or that some of the fruits can start to change from flower while others, of the same fruit, haven’t but will follow and fruit later on. However, in fruits which their flowering is not considered to be a change to a fruit, like watermelon, it is not permissible to sell. It is forbidden to sell almonds in the flowering stage, and forbidden to sell figs before they start to ripe, what is intended is to sell it while on the trees i.e. as a tree guarantee, because selling of fruits on trees is on the condition of being fit (for consumption), by an evidence to show the starting process of the fruit to ripen. He ﷺ explained the rule of every fruit and every type specifically, He ﷺ said regarding the grain that it must become hard, and that the black grapes that it must become black. The ruling is regarding the readiness of each species of fruit regardless of the others and of every type regardless of the others. The words ‘its benefit’ are evident, mentioned in the Hadith regarding the same species and type is true regarding some fruits even if few, as well as the nature of fruits show that they ripen in sequential stages. From this it shows that it is not permissible to guarantee any tree, i.e. to sell the fruits of any tree before it is fit (ready to be eaten). I pray that this answer is clear. Previous PostSehwan Bomb Blast: It is the United States that Enables Hostile Indian Intelligence to Attack us from Afghanistan!